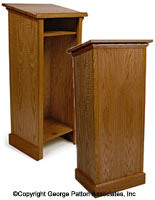 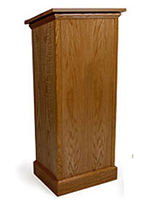 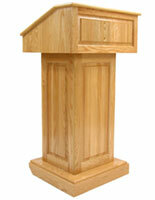 These medium oak pulpits are great for schools, churches and other venues as a presentation stand. 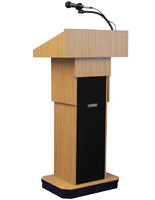 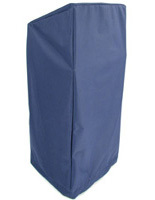 Each podium is features a durable wood and plywood construction with a water resistant coating. 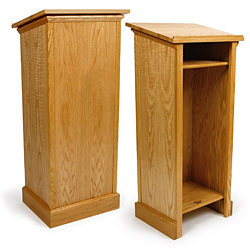 The oak pulpits also feature an open storage shelf and an angled reading surface for books, laptops and other materials. 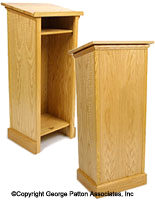 The church lecterns measure 45" tall and have a footprint of 20" x 16.3", making them great for aa variety of environments. The water resistant wood pulpits require minor assembly by screwing the reading surface onto the top of the frame. 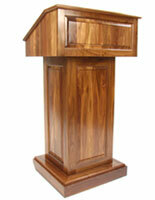 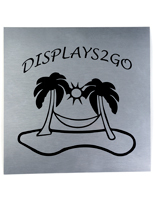 The podiums are also available with a lighter or darker finish.